All credit to a brilliant interview with Richard Gendal Brown for the quote I used in my title. For the last several months I have been swept up with many others in the Bitcoin craze. Unfortunately, it seems that I am arriving somewhat late to this particular party, as the Bitcoin value has already gone from less than $20 to over $1000 in just one year. It would seem that people have accepted, at least for the time being, that a limited supply of purely digital money represents a legitimate store of value. With a total store of wealth at over 8 billion dollars, the value of Bitcoin today is at least partially driven by speculators looking to cash in on the rise of the currency. Nonetheless, the importance of the technology that underlies Bitcoin and its value to society is anything but speculation. Bitcoin as a technology is deeply transformative, and stands next to other great innovations of the digital age like email or HTML (read: the web). As a currency, Bitcoin may soon become is becoming the first global currency, but this may be just the tip of the iceberg. The invention of a distributed cryptocurrency is nothing short of a revolution and it is going to change your life in ways you cannot yet even imagine. While it is an amazing technological innovation, the idea of Bitcoin is actually beautifully simple. The basic idea is that Bitcoins are sealed within a unique cryptographic locker (private key) located at a unique address within a constantly updating public ledger of transactions (known as the Blockchain). Imagine a book which records who holds every single bitcoin at any given time, but each page of the book is written with its own encryption. In order to spend their Bitcoins, a user must have their cryptographic key to unlock their Bitcoins from their page in the Blockchain. You could then send the ledger out to all of your friends so that you all have a copy of everyone’s encrypted information, but nobody will be able to change anyone else’s data without access to their individual key. As people trade their Bitcoins for whatever reason, they must use their private keys to unlock their Bitcoins and send them to a different address on the Blockchain. 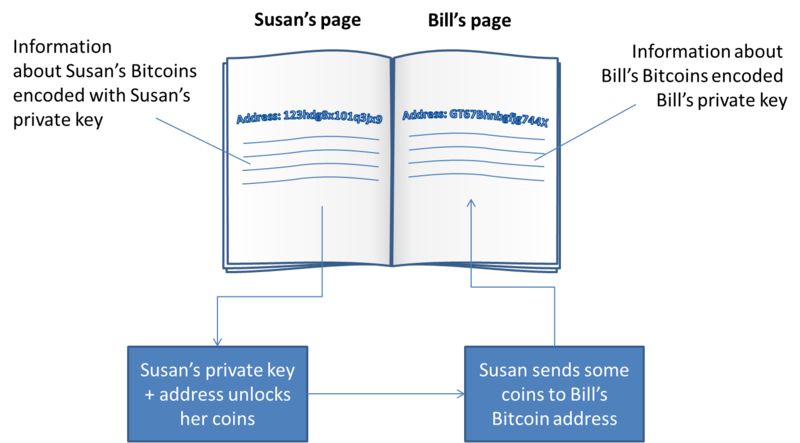 In the example above, say Susan wants to buy a pizza from Bill, she can use her private key to send Bitcoins from her Bitcoin address to Bill’s Bitcoin address. At this point the information on Bill’s address can be updated to include the new Bitcoins, which cannot be transferred from Bill’s account until Bill uses his private key to do so. Even with very powerful computers there is no feasible means that a traditional computer can crack the encryption on any Bitcoin address. Once associated with a particular public addess, it is effectively impossible to move Bitcoins without their specific private key. 3. Bitcoin is a distributed network. A huge network of computers all around the world is constantly working to update the information on the Blockchain. In addition to this, the computers within the network also all check that all the new transactions on the Blockchain are indeed legitimate. Every 10 minutes the entire Blockchain is updated with the new transactions that have occurred and a new master state of accounts is set. In exchange for doing the computational work necessary to confirm the Blockchain, owners of these computers are rewarded with newly minted Bitcoins. This provides the incentive for the network to support itself and grow to meet the demand for Bitcoin transactions. The genius of Bitcoin lies in its ability to distribute trust across an entire network. Because the Blockchain is simultaneously being confirmed by everyone across the entire network, there is no ability for one person or group of persons to falsify the public ledger. Thus, there is no need for a single trusted third-party to confirm everyone is acting in a fair manner. The rate at which new Bitcoins are created is set according to the protocol. Over time the rate of production will slow, and eventually stop at 21 million coins. There will never be more than 21 million coins. Until the number of 21 million is reached, a decreasing number of coins will be minted by the network. The predictability of Bitcoin means that people can know exactly how many will be available at any given time, and can predict how this will affect their value over time. Bitcoin is worth whatever the market says it is. While this is actually the case for all currencies, we often do not think of them this way. In reality, all currencies work this way. You can hold onto your dollar as long as you want, or ask to exchange your dollar for whatever goods you think that dollar should be worth. When we distribute that idea of value across an entire market, a consensus value emerges, and this is what the currency is worth. It is not clear what Bitcoin should be worth yet, but given its utility as a means of exchange across the world, that there is a limited supply, and that it is inherently predictable, it is likely that Bitcoin and/or similar cryptocurrencies will grow singificantly in importance and value over time. 6. Bitcoin is (almost) frictionless. While there are small transaction costs built into the Bitcoin system , the cost is much smaller than that which is charged by other transaction systems, such as paypal, banks, or wire transfer companies. The transaction cost of a Bitcoin transaction is also a flat amount, so no matter what the size of the transaction, there is a similar cost (currently around the equivalent of 10 cents). Combining the very low cost of transactions with the high speed of transactions, Bitcoin offers an almost frictionless medium for the movement of value from one place to another. Value is a complex and inherently difficult thing to determine. How much is a glass of water worth? It depends on how thirsty you are. Similarly, the value of Bitcoin is not yet clear but if we look to those who are most thirsty for this kind of innovation it may be those living in developing nations who do not already have access to banks who will lead the charge towards the uptake of cryptocurrencies in the coming years. The power of a savings account which your local governement cannot reach (or inflate out of value) is of great worth to people who have never had one. 8. Anything can hold Bitcoin. Because Bitcoin is simply a cryptographic protocol to associate a unit of digital wealth with a particular address on the Blockchain, anything that can hold the public and private keys can hold Bitcoin. This means that anything that can store the 256 bits of the private key (about 64 alphanumeric characters) and the 160 bits of the public address can store Bitcoins. A text file, a piece of paper, a coin, a stone tablet, you could even write it out on beach sand – literally almost anything can hold Bitcoin. Anyone who then has the public address for that Bitcoin account can send Bitcoins into it, so in this way Bitcoin allows you to send wealth directly into anything. 9. Anything that can send data can send Bitcoin. Anything that is connected to the web can theoretically hold and trade bitcoins. In this way, it could be possible for your fridge to hold a certain amount of bitcoin and then trade for services. 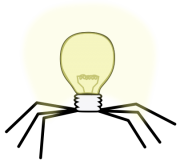 For instance, when you run out of groceries your internet enabled fridge could search the internet for the best price on milk, negotiate a deal, send Bitcoins to the local grocer, and have the milk delivered all without the need for your involvement, except maybe to put the milk into the fridge when it gets there. While the example of the fridge buying your milk for you using Bitcoin might seem like a kind of a silly example but the fact that machines can directly trade value quickly opens up more exotic possibilities. One could imagine an autonomous car which drives around picking up passengers, charging them for its services, purchasing electricity to charge itself, bringing itself in for servicing, all using Bitcoin. This kind of automated car could theoretically accrue wealth over time with little or even no human involvement. Given that cryptocurrencies like Bitcoin create a means to transmit wealth based entirely on the transmission of data with almost no friction, this opens the opportunity to create self-enforcing contracts. The simplest example would be an escrow contract, wherein money is held in a contract between two parties until both agree the money, or some proportion thereof, should go either to one or the other person. In this way, the money would not be accessible to either party until an agreement can be reached, again with little or no transactional cost for either party. Another simple example would be an insurance type of contract, wherein if a certain weather event occurs, say a snowfall of over 20 inches was predicted by 3 weather agencies, then an automatic payout could be made to a plow company. Another example would be a contract to pay an employee or contractor or a certain amount of money for achieving a set deliverable (such as increasing sales or web traffic). These kinds of self-enforcing contracts would not be very different from what we have today, with the exception that they would be automatically enforced by the rules established in the contract. There could be clauses instated into the contract to allow arbitration through a certain legal system, but there is no implicit need for this. When one really starts to contemplate what could be done with cryptocurrency based contractual agreements that can physically hold funds, and distribute them according to a mathematically defined set of rules could truly revolutionize every facet of our lives. These kinds of programmable applications of cryptocurrency may go beyond what Bitcoin is alone capable of, and is being pursued in the exiting new Ethereum project. So what is most exciting about cryptocurrencies? The answer to this is almost certainly something that we have not yet even thought of, and this is why I can’t help but get more excited for the future of cryptocurrencies every day. In a world where it often seems impossible to find anything on which we can all agree, Bitcoin has found a way to distill value directly from that one thing on which we must agree, mathematics. The problem here is that with bitcoin, social safety nets are all but impossible. And more importantly, so is UBI. By social safety nets do you mean forced taxation? Otherwise bitcoiners are huge on giving to charity, just look at seans outpost. While I agree that bitcoin would make something like a basic income difficult, this does not mean that the idea of cryptocurrency and basic income are mutually exclusive. For instance, a government backed cryptocurrency could be designed to give all citizens a certain amount back from that which is exchanged. For those who don’t like the idea of a government forcing this on people, there is no reason a corporation could not set up a similar system of a set income for shareholders. Nice post. Thanks for the concise overview. I wonder about the stability of Bitcoin. The US Dollar is relatively stable because the actions of the US Government are somewhat predictable and stable. There’s no powerful dictator who could make sudden, drastic changes to policies that would then radically affect the value of the dollar. But the creators of Bitcoin are anonymous. We don’t know who they are, what they want to do, or have any means of constraining their actions. Would it be possible for them to change their minds and produce another 10 million Bitcoins instead of stopping at their stated limit? That would devalue the existing Bitcoins. Could they somehow steal Bitcoins using some built in system that only they are aware of? It seems to me that there is too much potential for radical volatility with Bitcoin given that its creators are anonymous and somewhat unconstrained. I’d be interested to hear your thoughts (or anyone’s) on that. Thanks again for a great post on an interesting topic. I would encourage you to l please read more about bitcoin, because you seem to have some major misconceptions about it – namely that the creator has any influence over the pricing/usage, as he/she has none. Also, you seem to think that there is some way to create bitcoins beyond the predetermined limit, but there is not. Finally there is no way for someone to “steal” bitcoins through some yet-unknown process, as there is no who could do this; there is no central authority. Great post. Seems too elegantly simple though to work long term. Eventually there will be other crypto currencies and how will the use of those currencies affect the value of a Bitcoin (or other crypto$) ? For ex., new currency arises and I can buy a gallon of milk with my “electro-dollar”, but how does that affect the Bitcoin value of a gallon of milk? What if there are 100 crypto currencies in play? Would the value of the various currencies stratify based on the technological acceptance (standards) by various applications, etc. ? Going to be interesting to see how Gov policy tries to keep up.